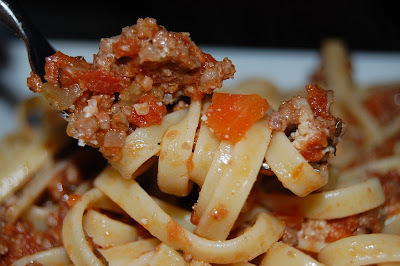 Bolognese is one of those sauces that screams comfort food to me. 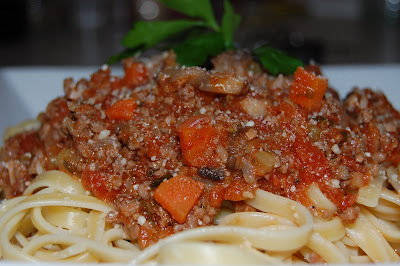 What is better than a thick meaty sauce with vegetables? This isn't one of those 30 minute sauces either. It takes some time for all the flavors of this sauce to meld together. I found a recipe on Cook's Illustrated, and followed it a bit, but then did things my own way. I let it simmer for about an hour and a half, and I probably could have let it simmer longer over lower heat, but it is a weeknight, and we were hungry. I served this with fettucini, but I think any pasta would go just fine. Don't forget some crusty bread, and of course a glass of wine to complete the meal. Heat a large pot over medium high heat. When it comes to temperature, add bacon and sautee until brown. Remove from pot and discard all but 1 1/2 - 2 Tbs. rendered fat. Add carrots, onions, celery and mushrooms and saute until soft. Add ground beef and garlic. When almost completely brown drain in a strainer and return to pot. finally add tomatoes and paste and stir to combine. Let cook for an hour and a half. Serve over whichever pasta you fancy, top with parmesan and enjoy! Finally! I say finally because Chad was supposed to make this last Thursday to go along with our chicken and apple sausages while I was at a class. But, time got the best of him and it just didn't work out. So we ended up eating Arbys. He made one over the weekend to bring to mom's for Easter, but it got left behind. On the counter. So that one went into the trash. So tonight I decided to do our original Thursday menu. I baked the sausages and served this alonside them. I credit Chad for finding the recipe on Allrecipes though I cooked this one tonight. 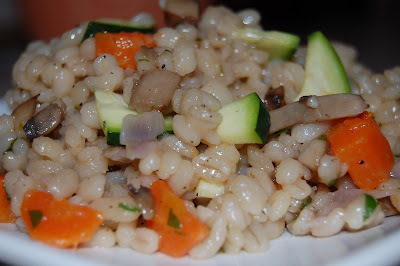 If you are a barley lover, this is a recipe for you. The lemon add a nice burst of tanginess, and the zucchini is still very crisp since it goes in at the end. Add the remaining broth and bring to a boil. Add the barley, lower the heat, cover, and simmer until the liquid is almost absorbed, about 50 minutes. Add the zucchini, parsley, oil, and lemon juice. Simmer for 5 more minutes; season with salt and pepper. This Easter, well, EVERY Easter, our family gathers at my Mom's house. She still keeps the tradition of hiding our baskets (which we LOVE by the way) and she writes out sequential clues on scraps of paper that have us scrambling all over the house, garage, deck, and backyard until we end up with our basket of goodies. It's usually a race between Chad, my brother, niece, and I. We hurry around the house, no doubt looking silly. We like to pretend that mom (err, the Easter Bunny) hasn't out witted us with the clues, but there is always that one (or two) that stumps. Every year someone finds their basket first, and someone is last, but it really doesn't matter. This year, unlike others, I was able to contribute something to the dinner table. The dinner items are usually taken care of. 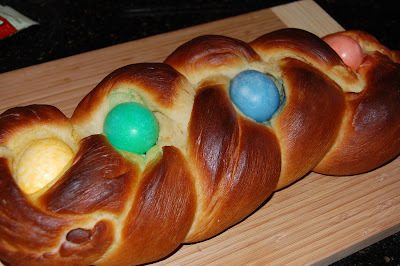 This year I decided to make an Easter Egg bread to go along with the baked ham that was being served. I found this recipe at Taste of Home. The instructions were easy to follow, and the time for the rising of the dough to the end product was about 2 hours. Not as time consuming as some other breads I have made. 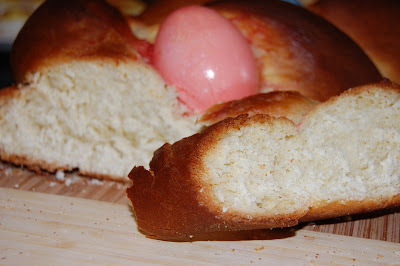 I loved the decorative eggs, although they did bleed a little into the dough. I have no clue how to prevent this, so no tips on what I would do next time. The bread itself was extremely tasty, and a great decoration as well. I love the slight sweetness of it, the crust had the most perfect texture and I plan to use some of the left overs to make french toast. 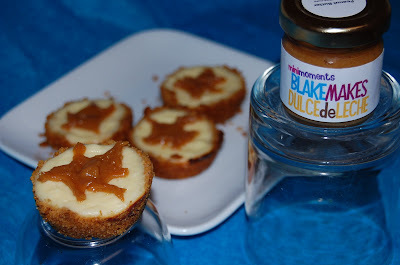 This is a recipe I will definitely be making again, even if it isn't Easter. In a large mixing bowl, combine 2 cups flour, sugar, yeast, cardamom and salt. In a saucepan, heat milk and butter to 120°-130°. Add to dry ingredients; beat just until moistened. Add 3 eggs; beat until smooth. Stir in enough remaining flour to form a soft dough. Turn onto a floured surface; knead until smooth and elastic, about 6-8 minutes. Place in a greased bowl, turning once to grease top. Cover and let rise in a warm place until doubled, about 45 minutes. Dye hard-cooked eggs; lightly rub with oil. Punch dough down. Turn onto a lightly floured surface; divide dough into thirds. Shape each portion into a 24-in. rope. Place ropes on a greased baking sheet and braid; bring ends together to form a ring. Pinch ends to seal. 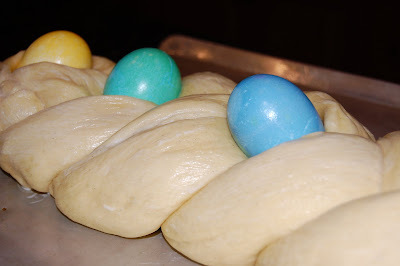 Gently separate braided ropes and tuck dyed eggs into openings. Cover and let rise until doubled, about 20 minutes. Beat water and remaining egg; gently brush over dough (I ended up using a little cream and water since I was all out of eggs). Bake at 375° for 28-32 or until golden brown. Remove from pan to a wire rack to cool. Refrigerate leftovers. Yield: 1 loaf. I had some chicken thighs defrosted in the fridge that needed to be used up TODAY. I put them out a couple of days ago, and it was either cook them, or lose them. 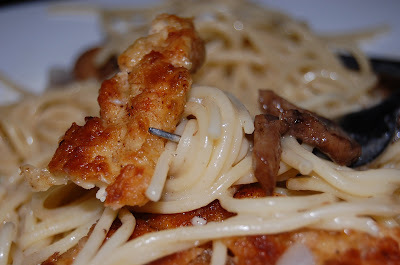 So not wanting to waste any food I cooked them to go along with the pasta below. They were yummy and and easy, just the way I like it. 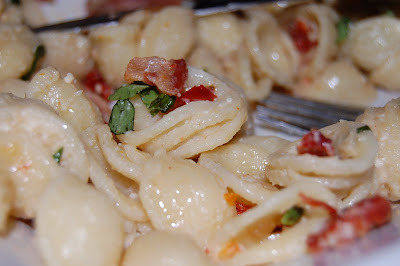 I just love this type of pasta. They look like little ears and are perfect for trapping delicious bits in it's indentation. 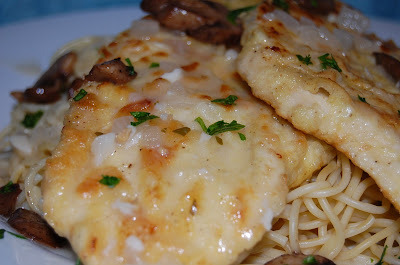 This is a very quick and easy meal for a weeknight, and a treat to take to work the next day. Cook Pasta according to package directions. 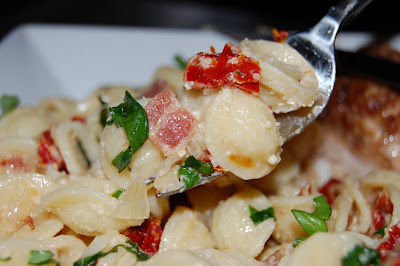 While the pasta water is heating cook bacon in a small to skillet until crispy. Drain on paper towels and set aside. Pour grease into a small container. Drain pasta, reserving a cup of pasta water and put into a large serving bowl. Wipe out bacon skillet with paper towels and add olive oil, bacon fat onion and sun dried tomatoes. Saute until onion is soft add garlic and basil. Saute a few more minutes. 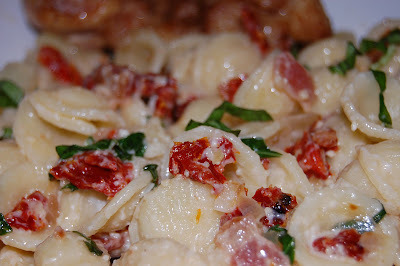 Toss bacon, onion/tomato/garlic/basil mixture, and cheeses into the bowl with the pasta. Add a couple ladles of pasta water and mix together thoroughly. Serve while hot. I've never heard of this recipe before. Don't know why, but I guess I never looked for Irish inspired foods as much as I have this past week. I knew I wanted to make a brisket for St. Patty's as well as cabbage but since Chad wouldn't eat cabbage on its own, I needed something else. When I came upon this recipe on various sites, I thought this would be a perfect way to introduce Chad to cabbage. I love the stuff and can eat it prepared almost any way (no Kim Chi for me), but combined with potatoes seemed like a winner here. In a large pot add potatoes and cover with water. Bring to a boil over high heat and boil for 15 minutes or until tender. Meanwhile heat 1 1/2 tbs. butter over med. high heat in a medium sized skillet. Add onions and cabbage and cook 10 minutes until cabbage is wilted and onions are beginning to caramelize. Add Garlic and cook about 5 minutes more. While the cabbage is cooking put bacon on small baking sheet covered with foil and cook in oven until crispy (about 15 minutes). When Potatoes are fork tender drain and return to pot. Add half and half, the rest of the butter salt and pepper. 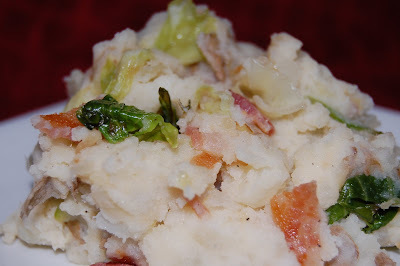 Add the cabbage mixture, and chopped bacon and mix well. To honor St. Pattys day I thought I'd make a brisket. 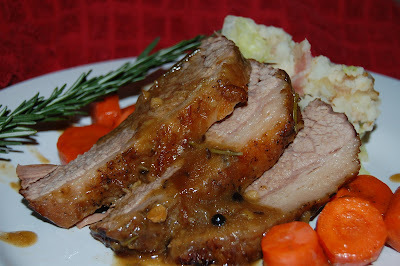 But to go a step further I decided to braise it in Guiness and Irish whiskey (I got this idea from the FN). After browsing a few recipes, I decided to not follow one but go at in on my own. It was so hard to wait for this. Chad and I were starving by the time dinner was ready, it took about 3 hours for this 2.45lb brisket to get nice and tender. It was well worth the wait, but I wouldn't classify this as a weeknight meal unless you don't mind eating a little later (we like to eat at 7ish). 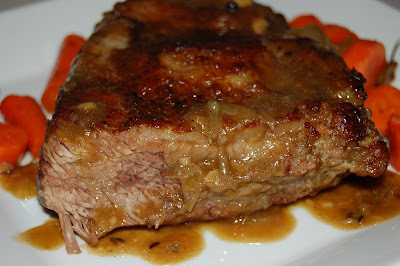 I made a simple gravy with the pan drippings and a flour and water slurry. It made a great addition to the whole dish. 3 medium carrots peeled and roughly chopped. Bring brisket to room temperature and season liberally with salt and pepper. Dredge in flour and shake off excess. Heat oil in a large cast iron skillet (or dutch oven) over med. high heat. Sear meat on both sides 4-5 minutes each until you get a nice brown crust. Add beer and whiskey (stand back when you do this) and the rest of the ingredients except carrots. 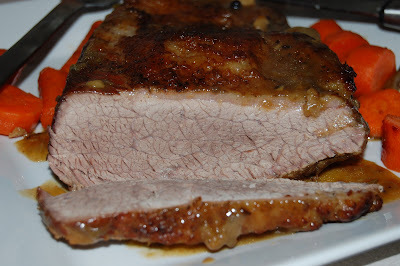 Bring to a simmer cover tightly and put in oven for 2 1/2-3 1/2 hours, or until tender (add carrots the last 45 minutes). Take brisket out of pan and let rest covered with foil for 10 minutes. Heat remains in the pan over low heat and bring to a simmer. Add 1/2 cup water and a flour and water slurry. Stir vigorously with a whisk until it all comes together and continue to simmer for a few minutes longer. Spoon over sliced brisket. To go along with the Greek theme tonight, I browsed around looking for a side dish. I came across this recipe. Because Chad and I love lentils, I decided to give it a go. It was very simple, but I did change the recipe up a bit. I really liked the flavor of this dish, and I will probably make it again, but I think next time I may make it a one pot meal by adding some meat or even shrimp. My modifications are in orange. Rinse lentils under running water. Place in a large pot with plenty of cold salted water and boil over high heat for 10 minutes. Drain and discard water. Heat 2 tablespoons of olive oil in a large pot. Add onions and shredded carrots and cook until onions are soft. Add garlic, pepper and 2 sprigs of fresh oregano and saute a few minutes longer. Add stock and tomato sauce and bring to a boil. 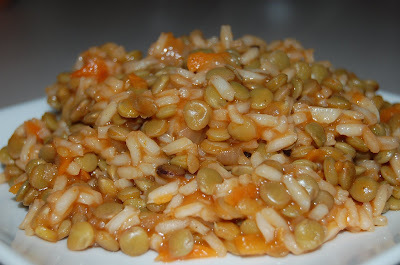 Add rice, lentils and salt to pot and simmer 20 minutes. These pitas were so delicious, and perfect recipe for use of the ground chuck I had in the fridge. I originally had no idea what to do with the meat. I didn't want to make some of the same old recipes that I have. So I went to where I usually go when I need some inspiration for a recipe, Cooks Illustrated. I always find what I'm looking for on that site. The best part is these recipes are tested to ensure the a fool proof end product. The recipe was relatively quick to make once the yogurt for the tzatziki had been drained. I think I may omit the oil for the frying next time though, my meat had enough fat rendered in the pan that it didn't really need the additional Tbs. of oil. I cut up some tomatoes, shredded some lettuce, added some fabulous feta cheese, and stuffed all of it in the toasted pita, and enjoyed a very nice Greek sandwich. 1. For the Tzatziki Sauce: Line fine-mesh strainer set over deep container or bowl with 3 paper coffee filters or triple layer of paper towels. Spoon yogurt into lined strainer, cover, and refrigerate for 30 minutes. 2. Meanwhile, combine cucumber, 1/8 teaspoon salt, and lemon juice in colander set over bowl and let stand 30 minutes. 3. Discard drained liquid from yogurt. Combine thickened yogurt, drained cucumber, remaining 1/4 teaspoon salt, garlic, and mint in clean bowl. 4. For the Patties: Adjust oven rack to middle position and heat oven to 350 degrees. Cut top quarter off each pita bread. Tear quarters into 1-inch pieces. (You should have 3/4 cup pita pieces.) Stack pitas and tightly wrap with aluminum foil. Process onion, lemon juice, salt, pepper, oregano, garlic, and pita bread pieces in food processor until smooth paste forms, about 30 seconds. Transfer onion mixture to large bowl; add beef and gently mix with hands until thoroughly combined. Divide mixture into 12 equal pieces and roll into balls. Gently flatten balls into round disks, about 1/2 inch thick and 2 1/2 inches in diameter. 5. Place foil-wrapped pitas directly on oven rack and heat for 10 minutes. Meanwhile, heat oil in 12-inch nonstick skillet over medium-high heat until just smoking. Add patties and cook until well browned and crust forms, 3 to 4 minutes. Flip patties, reduce heat to medium, and cook until well browned and crust forms on second side, about 5 minutes longer. (See below for tips on flipping patties.) Transfer patties to paper towel-lined plate. 6. Using soup spoon, spread 1/4 cup Tzatziki Sauce inside each pita. 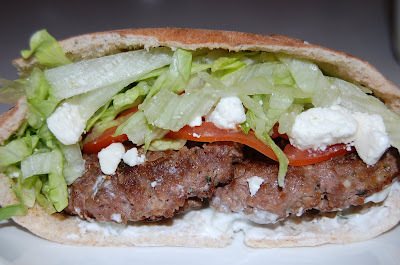 Divide patties evenly among pitas; top each sandwich with tomato slices, 1/2 cup shredded lettuce, and 2 tablespoons feta. Serve immediately. This is to Mrs.ErikaMay who isn't able to "Nest" at work during the day. And in all honestly, I'm only able a couple times. But, she does make my day (night) whenever she pops her head in and shares her thoughts, recipes, and comments. 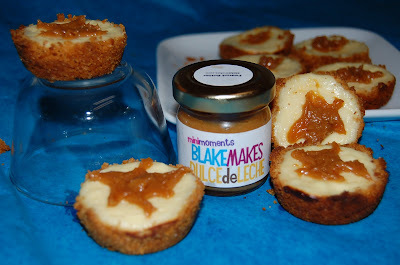 She also has an amazing blog Bean's Bistro, and her recipes and photos are AMAZING. So here's to you Erika! You make my Night!! MMM. I just love the lemony taste of the sauce in this dish. 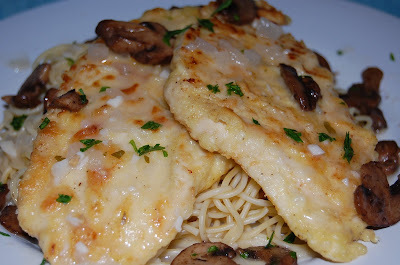 Paired with lightly floured, pounded thin, pan sauteed chicken cutlets and sauteed mushrooms and I'm in heaven. I got this recipe from the trusted Cooks Illustrated web site. It is one of my favorites and I can always find something with the ingredients I have on hand. I've been eyeing this recipe for a while and couldn't wait to make it tonight. I didn't change this recipe much like I do to others I have tried. I cut back about 2 tsp. of lemon juice (couldn't get any more juice out the one lemon I had) and added about a tsp. and a half to the pan of the finishing sauce. I decided to serve this over angel hair pasta because both Chad and I were in the mood for some pasta. I recommend this dish to everyone, it was just that good! 1. Adjust oven rack to middle position; heat oven to 200 degrees. Set wire rack on rimmed baking sheet and place sheet in oven. 2.FOR THE SAUCE: Heat 1 tablespoon butter in medium nonreactive saucepan over medium heat. When foaming subsides, add onion and cook, stirring occasionally, until translucent, 2 to 3 minutes. Add flour and stir until light golden brown, about 1 minute. Whisk in wine, lemon juice, and broth; increase heat to high and bring to boil, whisking constantly. Lower heat to medium-high and cook, whisking occasionally, until mixture is reduced to 1 1/2 cups, 10 to 15 minutes. Strain sauce through mesh strainer, return to saucepan, and set aside. 3. FOR THE CHICKEN: Set second wire rack on second rimmed baking sheet on counter. Whisk together flour, 1 teaspoon salt, and 1/4 teaspoon pepper in pie plate. In second pie plate, whisk eggs and milk until combined. Season both sides of each cutlet with salt and pepper. Using tongs and working with 2 cutlets at a time, coat cutlets in seasoned flour; shake off excess flour. Transfer cutlets to egg mixture; coat evenly and let excess run off. Return cutlets to seasoned flour; coat evenly and shake off excess flour. Place coated cutlets on wire rack on counter. 4. Heat 1 tablespoon each butter and oil in 12-inch nonstick skillet over medium-high heat; when foaming subsides, place 4 cutlets in skillet. Cook until well browned, 1 1/2 to 2 minutes. Carefully flip cutlets and continue to cook until lightly browned on second sides, 30 to 60 seconds. Transfer chicken to wire rack in oven. Wipe out skillet with paper towels. Repeat, using remaining 1 tablespoon each butter and oil to cook remaining cutlets in now-empty skillet. 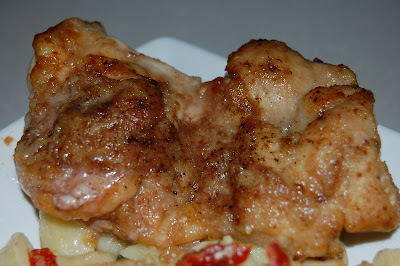 After transferring chicken to oven, wipe out skillet with paper towels. After a lovely Thanksgiving dinner yesterday at my mom's house there was quite a bit of turkey leftover. Knowing I absolutely love turkey, she bagged about 2 lbs. of it for me to take home. Why, you ask, were we celebrating Thanksgiving in March? Well, my bday was March 2nd and because I celebrated in Nola that weekend, my family ended up celebrating it last night. Whenever one of her children has a bday she makes them a birthday meal and invites family and friends over to celebrate. Whatever we want she'll make. My yearly request is to have TG dinner with all the fixen's. I love turkey and don't get to eat it that often (besides having it in a sandwich) so I figured this is one way to get the delicious roasted bird on a day that isn't realated to the pilgrims and the Mayflower. I was going to have chicken tonight, but decided that using the turkey was a more economical choice since it probably won't be as good tomorrow. 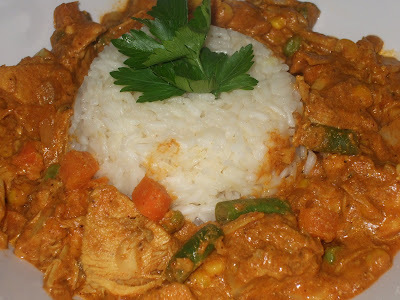 Chad was in the mood for curry so I decided to make it into a curry dish. I added some frozen veggies that I had on had and toasted up some almonds to throw in as well. Very quick and simple meal, but with a ton of flavor. Heat butter in a large skillet over med. high heat. Add onions and cook until soft and transluscent. Add garlic and cook a minute longer. Add bay leaves, ginger and spices and lemon juice. Stir to combine cooking for about a minute. Add the tomato sauce, yogurt and half and half stirring to combine. Add turkey and simmer about 15 minutes over low heat. Add toasted almonds and veggies and cook 5 minutes more. Serve over rice and garnish with fresh parsley. 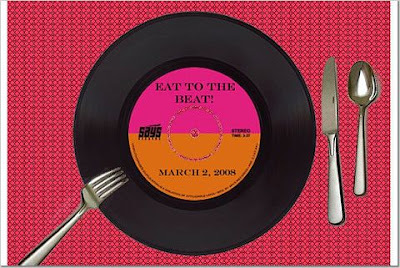 This is my entry for the "Eat to the Beat" event that Elly of Elly says Opa! is hosting. I'm a couple of days late because I was out of town, but I asked if I could be a little late on my post and she said she could squeeze me in. I browsed a ton of songs that had food mentioned in the lyrics but I just wasn't satisfied with any of them. Then today my friend Jen reminded of a song by Widespread Panic, which I never would have remembered on my own since I am not a huge fan. But after listening to the song a couple of times it really grew on me. 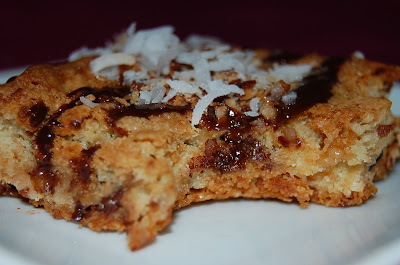 So now I needed a recipe with coconut. I wasn't about to make a pie, and I didn't want a savory dish since I had already planned tonight's dinner. 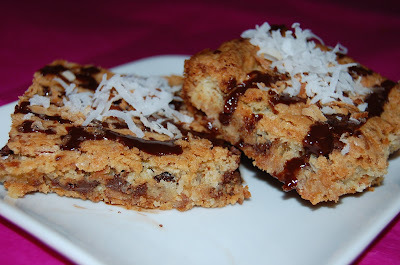 I went to epicurious and typed in "coconut" and this lovely blondie recipe came up. 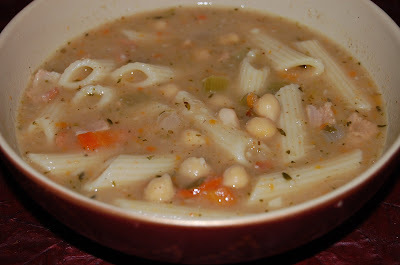 I made this soup last week solely for the fact that I needed lunch the next day. I toyed with the idea of whether or not I was going to leave the white beans whole, or puree them. I decided to puree one can of the beans and leave the other 2 whole. This is one of those soups where you just add ingredients as you go. I checked what was in the pantry and fridge and just threw it all in. Turned out great and now I have some extra portions in the freezer that I can bring to work the next time I have nothing to bring. Cook bacon in a large heavy bottomed pot over medium high until crispy. Remove from pot and and drain all but 2 Tbs. of fat. Add onion, thyme, oregano, bay leaves, celery and carrots. Saute until onions are soft. Add garlic and saute a few minutes longer. 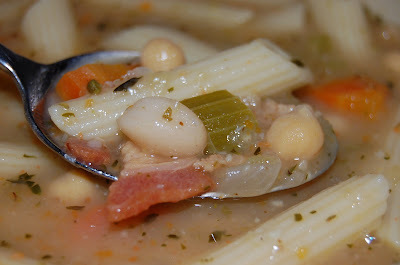 Add stock and one can of the cannellini beans. Let cook for 20 minutes and blend with an immersion blender, or transfer 1/2 the soup to a blender. Add the rest of the beans and penne and cook for 15 minutes longer.